Congress President Sonia Ghandi Finally pushed for announcement on formation of Telangana on 30th July 2013 at 7.20 PM. Telangana will be formed with 10 districts with Hyderabad as Shared Capital for 10 or more years of the two states to be created out of the bifurcation of Andhra Pradesh. Demand for smaller States Uprising This is the clean indication that current chief ministers are unable to handle the state development if the states are bigger. Some of the chief ministers are handling all the districts in equal proposition unlike this is not happening in andhra pradesh. some districts are getting justified and other are not. like wise the demand of Gorkhaland in Bengal, Vidarbha in Maharashtra, Purvanchal, Bundelkhand, Awadh and Western in Uttar Pradesh. The same may applies to Prime Minister who is sitting in delhi dont seem to be bother for south, west and easter part of india, May be we need more than one prime minister for northa and south for our country if congress rules for another decade. The division would be 10 Telangana districts into a separate state which will have 17 Lok Sabha seats and 119 assembly constituencies and the rest of Andhra Pradesh will have 25 Lok Sabha seats and 175 assembly seats and new capital to be formed in Andhra, More chances of chosing Vijaywada as a capital for Andhra Pradesh if LokSabha and RajyaSabha approves the decision of bifurcation of the state. Telangana has the largest area, with 114,800 square kilometres (44,300 sq mi) . Andhra Pradesh has an area of 92,906 square kilometres (35,871 sq mi) and a population of 34,193,868. Rayalaseema has a total area of 67,299 km2 with a population of 15,174,908. 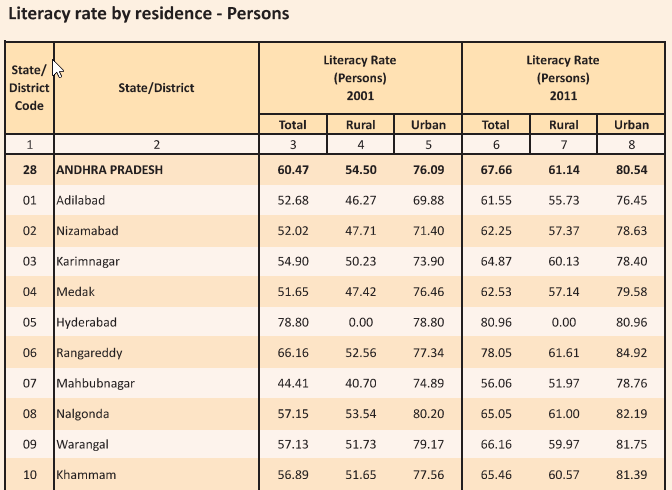 Telangana has 86% Hindu, 12.4% Muslim, and 1.2% Christian population, About 77% of Telangana people speak Telugu, 12% speak Urdu, 11% speak other languages.